In a previous article – https://technology.amis.nl/2015/03/15/docker-take-two-starting-from-windows-with-linux-vm-as-docker-host/ – I have discussed my first steps with Docker. With Windows as my host environment I used Vagrant to create a VirtualBox VM with Ubuntu. In that VM I installed Docker can played around creating some containers, images and eventually an image for Oracle WebLogic 12.1.3. I leveraged the excellent work by Mark Nelson (especially his article https://redstack.wordpress.com/2014/11/14/gettingn-to-know-docker-a-better-way-to-do-virtualization/). 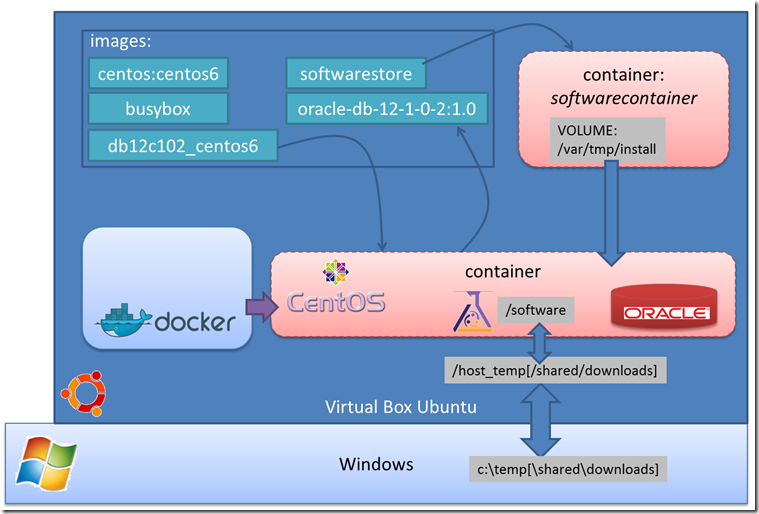 In this article I am taking things one step further by creating a Docker container – and from that container an image – with the latest Oracle Database release 12.1.0.2 (Enterprise Edition). Again, the Mark Nelson article is my guide and Edwin Biemond – champion of all things automated – provided the Docker file and Puppet scripts that get the job done. Edwin was also kind enough to help me out when a library dependency caused problems. 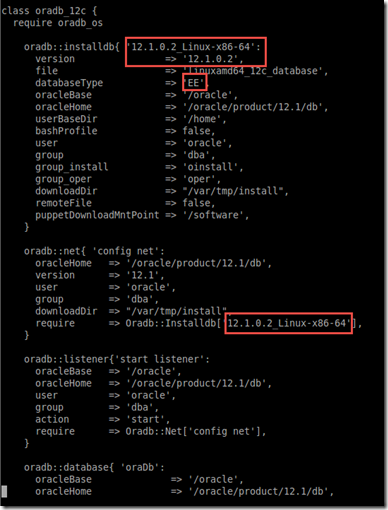 I ran into the (default) size limitation on Docker containers (10 GB) while installing the Oracle Database. 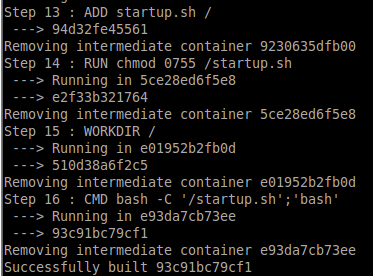 I resolved this challenge by mapping a host folder to the container (with the original database software) and by sharing a volume from a second container that was used as temporary (staging) area. Thus I virtually expanded the file system of my container considerably beyond the 10 GB mark. 0. preparation: (as discussed in the previous article) Get a Ubuntu based Virtual Machine (Virtual Box) running on my Windows host laptop. Install Docker into this VM. Download the Oracle Database software (12.1.0.2 Enterprise Edition) from http://www.oracle.com/technetwork/database/enterprise-edition/downloads/index-092322.html. Two files are downloaded to a folder on the host with a total of some 2,6 GB. Note: the Puppet scripts expect two files with names linuxamd64_12c_database_1of2.zip and linuxamd64_12c_database_2of2.zip. I renamed the downloaded files to match these expectations. 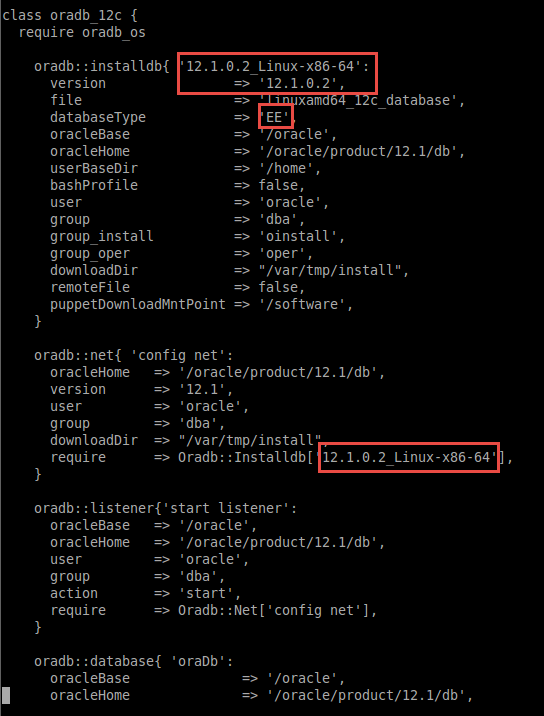 At the end of the article, I have both a container and image with the Oracle Database 12c (12.1.0.2) running – based on the oradb Puppet Module by Edwin Biemond. The container exposes port 1521 where the database can be accessed from the host as well as from other containers – as we will see in subsequent articles. With a simple Dockerfile – derived from Docker Database Puppet – I create a base image that provides the starting point for the container that will hold the Oracle Database installation. 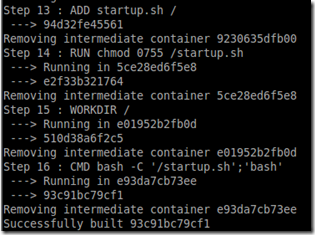 docker build -t db12c102_centos6 . Note: Initially I used the exact same Dockerfile Edwin published – with an edited site.pp file in order to install the 12.1.0.2 Enterprise Edition instead of the 12.1.0.1 Standard Edition. I then ran into disk space limitations. Apparently, copying the software zip files (2,6 GB) to the container and extracting the content of these files inside the container occupied so much space that the installation was aborted. Adding this line (to make sure highline gets installed before a version of highline with a more demanding requirement on Ruby is brought along by librarian-puppet. docker build -t softwarestore . This results in an image called softwarestore which exposes its folder /var/tmp/install as a volume that can be used as expanded file storage from other containers. The container softwarecontainer is now available along with its /var/tmp/install volume that will be used during database installation as staging area. with host folder mapped into it and with volume shared from softwarecontainer. Inside the container: Open the site.pp file at /etc/puppet in a text editor. Note: this directory and this file were created along with the base image in step 1. Note that only a few changes are required to process EE instead of SE and 12.1.0.2 instead of some other version. When Puppet is done, we have a running database. All temporary files have been cleaned up. SQL*Plus is started and we can for example select from dual. Note: The database sid = orcl. Password for SYS and SYSTEM are Welcome01. Using exit twice – once to leave SQL*Plus and once to exit the container, we return to the host. The container is shown (agitated_bohr). A sizable image – that through export and import and be reduced in size although that would severe the link with the base centos image. will do the job just as well. Note: I have added the –privileges=true here because I ran into a problem with not being able to switch users in the container. This discussion led me to use this additional parameter. SQLPlus starts and connects us to an idle instance. Then type startup – and the database is started. The service orcl.example.com and the instance orcl are both ready. These are really notes to myself – little things I needed or came across while going through the steps described in this article. Docker stores container data in the directory /var/lib/docker/containers in Ubuntu. When a Docker container is restarted its, IP Addresses changes. Applications as well as others servers that were communicating with the container before the container restart, will be unable to communicate. Configuring a DNS server on Docker and configure consumers to use DNS names is a solution to the IPAddress change after a container restart. As the screenshot shows, the highline component that apparently gets installed as part of librarian-puppet requires a higher Ruby version than is available. just prior to the line that installs librarian-puppet. This makes sure that highline – a version that does not have this advanced Ruby dependency – is already around when the librarian-puppet is installed. It will therefore not try to install the latest version of highline, that gives us the problem. Hi Lucas, where is startup.sh located? Can you share the details of puppetfile and site.pp content? i see the site.pp located for me under manifests. not sure is this is the right one. I donot have one under /etc/puppet. My site.pp has only the following info. where as the steps shows all the oracledb12c info is inside it. Could you please let me know what i was missing? Can i do it to fix this problem ? Did you get the file puppet/Puppetfile, am also facing same issue. Please let me know.